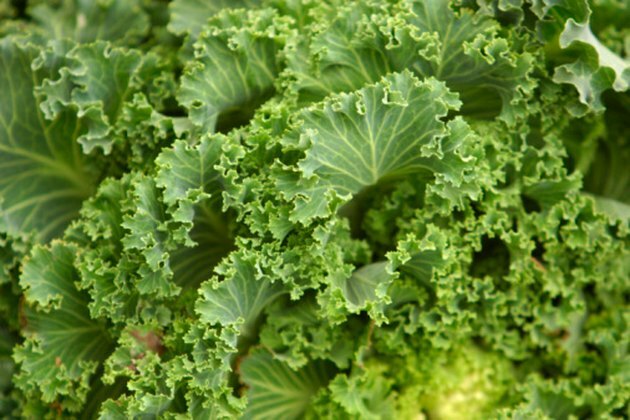 With the highest possible Aggregate Nutrient Density Index, or ANDI, score of 1000, kale is considered a superfood. The ANDI score reflects a food's nutritional density in comparison to its calories per serving. In particular, kale is high in vitamins A, C and K, dietary fiber, manganese, calcium, copper, potassium and health-promoting phytonutrients. It is a good source of iron, magnesium and other minerals, as well. Not only is kale healthy, it's a versatile leafy green vegetable that is quick and easy to cook at home, even in the microwave. Wash the kale under cool running water in the sink. Flip the leaves over repeatedly in the colander, thoroughly rinsing them all to remove dirt and debris. Give the colander a few shakes when done. Don't dry the leaves, as the moisture helps the leaves cook in the microwave. Chop the kale leaves into manageable-sized pieces on a cutting board. Put it into a microwave-safe bowl. Toss the leaves with a little salt and lemon juice, if you like. Cover the bowl with a paper towel. Microwave the kale on high for about two minutes per every 2 cups. Remember that all microwaves are different, and the freshness of the kale can also affect cooking time, so this is just an estimate. Watch the kale to stop cooking it when it's fully wilted. Select kale with a deep green color to ensure it holds up in the microwave. Inspect leaves to avoid wilted or discolored kale. Pick heads with thick, sturdy stems. Opt for smaller leaves, which are more tender and not as bitter as larger leaves. Store kale unwashed in a sealed plastic bag for up to three days until you're ready to cook it. Keep in mind that it becomes increasingly bitter every day.